List of Abbreviations of Roger Bacon's Works. C. Crisciani - M. Pereira, Introduction to the Philosopher's Laboratory. Credits of the Illustrations - R. Lambertini - R. Martorelli Vico, Are There more Versions of the Communia Naturalium? Soundings of the Manuscript Tradition - C. Crisciani, Universal and Particular in the Communia Naturalium: Between "Extreme Realism" and "Experientia" - A. Rodolfi, Dicitur materia propriissime et strictissime. 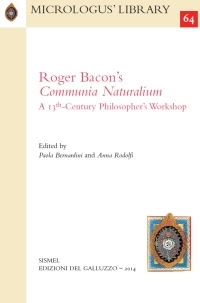 Roger Bacon and the Ontological Status of Matter - M. Pereira, Remarks on materia naturalis - P. Bernardini, Temporibus autem meis. Theologians' Errors with Regard to the Human Soul in Roger Bacon's Communia Naturalium - C. Panti, Natural Continuity and the Mathematical Proofs against Indivisibilism in Roger Bacon's De celestibus (Communia Naturalium, II) - J. Hackett, Motion, Time and Aevum in Roger Bacon's Communia Naturalium: Context and Content. Indexes.